Earlier this week I received an email from a reader asking if I could publicise her pop up fabric blog store here on my blog. I don't often do this sort of thing, but after looking at the beautiful fabrics over Designer Fabrics Australia at I decided that I just had to share the link. It turns out that the blog owner, Liz, is a fellow fabric hoarder who has amassed a huge amount of very beautiful and designer fabrics on her travels around the world, including from Paris and the New York fashion district. Unlike myself though, she has acknowledged that she has too much fabric and will probably never have the time to sew them up. So very smartly she has decided to refine her stash and make them available to us fellow fabricholics (provided you're in Australia though). There is quite a range of different colours and fabric types, in various lengths and some designer and some not. These are all one off pieces, so when the fabric is gone, it's gone. And postage is via Australia Post envelopes so it's quite reasonable (cheaper than buying these fabrics from New York I'd say). Even if you're not in the market to buy some fabric I can recommend having a sticky beak because Liz has posted some lovely inspiration pictures to go with the fabrics which are interesting enough on their own. 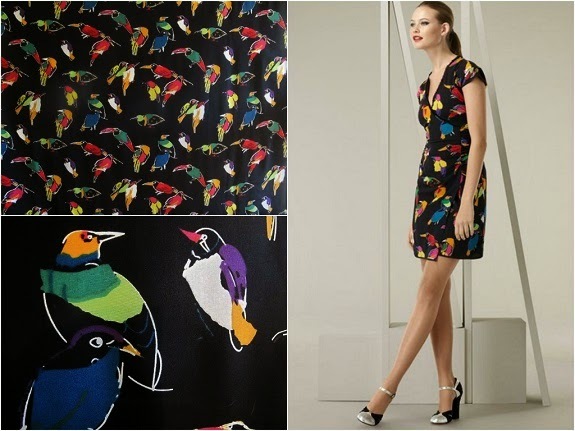 I haven't bought anything yet, but am seriously considering the length of Marc Jacobs exotic birds silk crepe de chine - it's not my usual style but it's very cute. Plus Spotlight is currently having a $5 Vogue pattern sale at the moment which means I could pick up the perfect pattern to go with it too! Apologies to everyone's wallets and stashes in advance, but I thought that some of you might like to know! Powering on with my catch up of Burda of the month projects, I made a quick knit top from the July issue. Admittedly I did trace this pattern out a few months ago, but as we all know actually getting started is what takes the most time sometimes! This could be due to the difference in stiffness between the solid fabric (a thick ponte knit) and the stripe fabric (a thinner ponte knit), but is probably just the way I sewed it. In her review Allison mentions that the instrucitons are really good to get a nice finish on that point, but I have to admit to not reading the instructions - the magazine is in storage somewhere with the rest of my sewing stuff so I had to wing it. Lesson learnt - one should at least glance at the instructions before sewing, even if they are Burda instructions! I didn't find this too low at the front which Allison mentioned in her review and which also seems to be the case in this version made by an attractive Russian sewist over at the Russian Burda Style site, but looking at these photos my band seems extraordinarily large, particularly there at the front. Maybe it was a case of dodgy tracing on my behalf but it seems to have avoided that problem for me at least. Overall I don't mind this pattern at all, and will make it again if I can find two complementary fabrics - I'm hopeless at colour and print matching. If I make this again I will read the instructions to do that centre v neck point a bit better, and would also cut the v neck of the band on a fold rather than have a centre front seam there - I couldn't see the purpose of it at all. I would also use a softer knit than a ponte knit, because the band is doubled it gets quite thick and didn't press well at all so I had to topstitch around the edge of the band to get it to sit flat. And now onto my next project - I feel a dress coming on, since it's been a while that I've made a dress and now that it's spring I definitely need something cute and comfortable to wear. 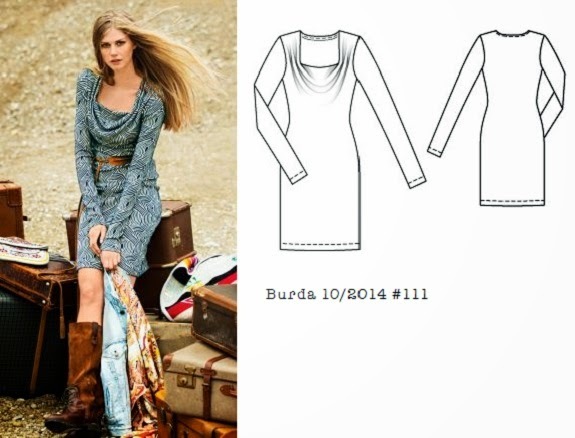 June Burda issue - am I glad to see the back of you! Nothing in particular caught my attention in the June issue, and I was having a real mental block in trying to visualise something to make for my Burda of the month challenge. Honestly, if I wasn't making myself do one from each issue this one would have been put on the bookshelf and forgotten about. But it's not you Burda, it's me! I've come to realise how incredibly difficult it must be for the Burda designers to come up with so many patterns each month that cater for people of varying ages, sizes, styles, sewing skills, seasons, and whether they are new to Burda magazine or whether they have been collecting them for years. I'll just have to make sure I stand around posing instead, and develop my own "blue steel" type pose! The fabric I've used is a heavy stretch cotton bought some time ago from possbily the Remnant Warehouse. It's a printed fabric, light grey with a black cross hatching that gives the impression of a linen type weave, minus the annoying wrinkles. And it goes great with my favourite Liberty cotton shirt too, which is a summer staple for me. Now onto the July issue - I've already traced out the pattern and cut out the fabric so I'm well on the way to catching up on my missed issues. Spring is in the air around these parts and a spring is finally back in my step! The return of my sewing mojo has coincided with me finishing up a few things that have been keeping me busy lately so I'm hoping I can now get busy on my sewing once again. We've finally finished the work on our house and it's now on the market for the next month before being auctioned in early November. It's going to be a challenge keeping it clean for the next month, but at least the hard work is over and done with. This is pattern #111 from 10/2014 issue, which is a super simple knit dress with an interesting cowl neckline - the drapes are stitched down in three little folds on either side of the neckline. Usually I prefer dresses made out of woven fabric because I like the structure and crispness, but I have to profess my love for this dress. It was really difficult to get a flattering photo of this dress though, and it does look better in real life. I think I need a dressier pair of heels, perhaps something high and strappy to wear with it (but all my non-necessary shoes and accessories are packed away at the moment too!). Being small busted I quite like having a bit of excess fabric draping across the front, although mine doesn't seem to drape nearly as much as the dress worn by the model in the photo in the magazine. I made this mostly on my overlocker so it was really quick to make, being just a front, back and sleeves. The neckline is wide enough to not need a zipper, and I cheated by using that iron on Steam-a-Seam tape to do the hems and the back neckline mainly because I couldn't find a twin needle abut also because it looks neater. The only change I made to the pattern was to sew two vertical darts in the back to reduce the amount of fabric pooling in my swayback. I didn't want to do a centre back seam so I could make a sway back adjustment, but the darts seem to take care of most of the excess fabric so I could get a neat fit. I contemplated making this dress with short sleeves since we are now coming in to summer, but in the end I stuck with the long sleeve option because the fabric is stretchy enough to scrunch the sleeves up above my elbow for those hotter days. So overall I can highly recommend this pattern - it's really simple to make and has lovely lines and drape. There's also a pattern in this issue for this style as a top which has a slight variation at the neckline by including tabs to hold the cowl back at the sides which I can also see me making in the near future if I can find the right fabric. Speaking of fabric, I popped by The Remnant Warehouse to buy some black jersey to make a Halloween costume for Anna and since they are having a 25% off sale I may have accidentally picked up a few extra pieces! I really don't know how that happened, honestly!